This is pretty cool. 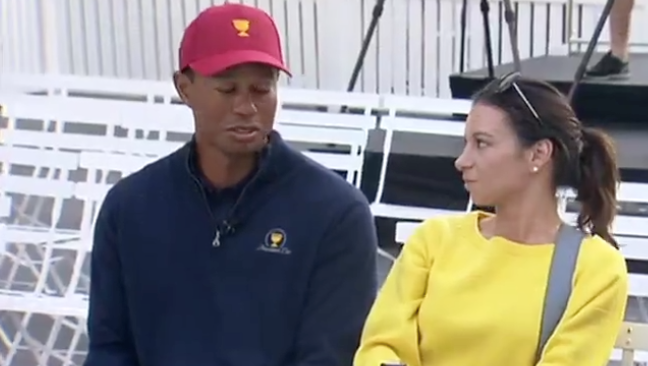 Tiger Woods and his girlfriend Erica Herman made a flying two day visit to Australia, apparently without an appearance fee, to do some recon and press ahead of his Captaincy of the 2019 US Presidents Cup team. Woods even had time to surprise two young kids on the golf course at Royal Melbourne. Awww this is nice. I'd say Hugo and Jemima got the shock of their lives when they saw Tiger Woods standing in front of them. In Australia! He also spoke in Brisbane about overcoming his anxiety issues to win at the Tour Championship. Tiger even had time for a dodgy four footer on the Eureka Skydeck. Scariest 4-foot putt you've ever seen? What a year it has been for the big cat!